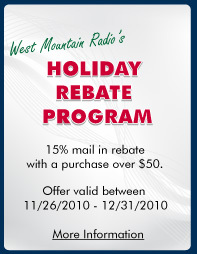 Your ability to order and receive West Mountain Radio products will not be affected at all. All of the West Mountain Radio product lines you are familiar with will continue to be sold at the same prices and carry the same product warranties...and of course, existing warranties will be honored. Best of all, all of these features have been added without passing the cost along to West Mountain Radio customers. Priced at $59.95, this handy device enables CW operators to quickly switch between two radios without having to wire keys in parallel or move cables. RIGblaster Plug & Play Troubles with Windows and New Hardware Devices? Sometimes Microsoft makes it sound like there will be absolutely no troubles when adding new hardware or upgrading your Windows operating system; but we all know better! As more and more electronics are being connected to your PC, Windows has a more difficult time recognizing all new hardware. West Mountain Radio developed USB drivers for the RIGblaster Plug & Play, and has provided them to Microsoft. These drivers are also provided on the CD that is shipped with the RIGblaster Plug & Play. What do you as a customer need to do when you first purchase a RIGblaster or upgrade your Operating System to ensure that Plug & Play is recognized and the correct USB drivers are installed? We have outlined some quick and easy installation tips to assist you in getting Windows to recognize the Plug & Play. Literally, we will look at three simple cases dealing with Windows 7, Vista and XP.